So pawsome! Have a happy new year! Wooooowooooooo! YOU SCORED BIG TIME ON THE MAIL THIS YEAR. AND THE USPS SHOULD THINK ALL OF BLOGVILLE FOR THE BUSINESS. What a haul! That’s almost 100 cards, household total – nicely done! We’ll have to put you on our list for next year and see if you can break into triple digits. Woooooooohoooo!! Was there ever any doubt??? Pawsome job and I can’t wait to have a dance at the New Years Eve Bash!! Millie’s expression kills me. 🙂 HAHAHA. BWHAHAHAHAHA…OMD, I can not believes your mom’s sister put dat note on da card….sneaky I tells you! But it is kinda funny. We is sendin’ all our stamps to Miss Lori too. If it can helps then we is happy to do it. We is puttin’ all our cards into a book so we can always looks at ’em. We think Walter is a bit of a poser…Bwahaahaa! Millie you have the more laid back pose. Your wall looks nearly the same as ours…same Cards. We see ours. PeeS We’re saving our stamps, too. What a lot of beautiful cards! Pawsome! We’re still getting cards in the mail. OMD there is just NO END to the sneaky stuffs the peeps will sink to… just to TRY and come CLOSE to OUR count. We are cracking up about the two cards from the same peep… which made cancelled them in the Count… BaaaWaaah… PEEPS!! What a Riot they are!! Merry Christmas! Way to go Millie and Walter. You trounced the peeps! 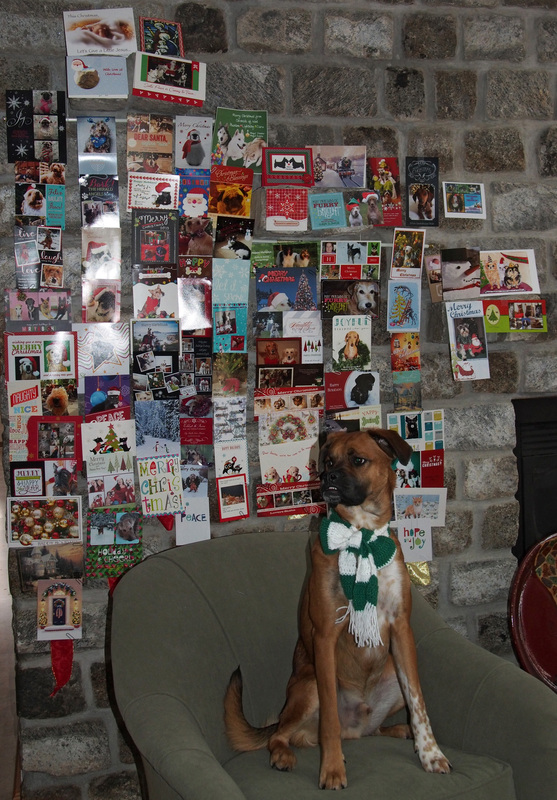 That is a pawesome display of cards, Walter and Millie! And great deed for Ms. Lorie. We did the same and you are right, it was just so easy!!! Wow, you really rocked that card count!!! We saved our stamps too, Mama is getting ready to send them off to Miss Lori !! Why that wall could be called your Hall of Fame wall for having friends. Looking forward to the New Years Eve Blast. Holy smokies! Look at all those cards you got! Good job. That is so pawsome about saving the stamps and it helps furrys!! I like that too! Incredible! Turned out to be a very full wall. Happy New Year to you! Wow so many cards! I collected my stamps too for the Greyhound rescue, hope every stamp helps a little. Have a Happy New Year, Millie, Walter& Bipeds. Did your pawrents do some sneaky things to get double digits? BTW Millie, you sure know some dance moves!! Happy New Year!! Happy New Year Millie And Walter! We won’t forget all our stamps, we know where they are heading. Hey you guys! Sorry we’ve been MIA – someone around here seems to take up a lot of time and energy. I don’t want to name names. I think you know who I’m talking about though! Hope you enjoyed Christmas – we wish you all the best for 2014! Hey Dennis you didn’t end up in our spam this time! Let’s hope it stays that way so we don’t have to rescue you from the spam folder. 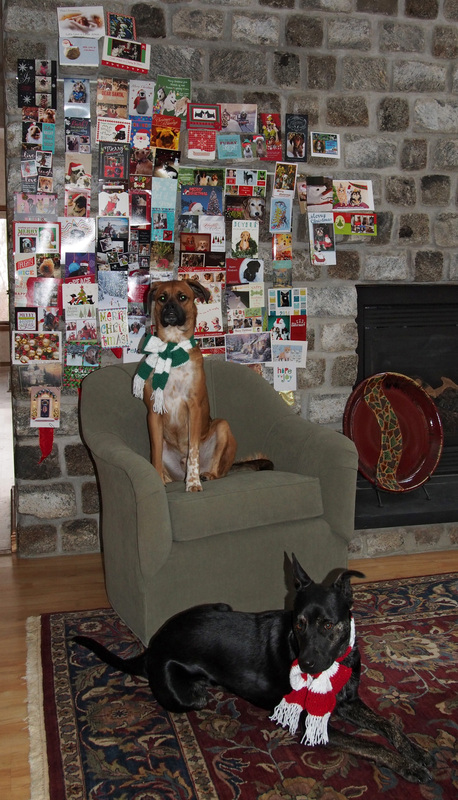 You both look quite proud with your Christmas card display! Happy New Year! I got a card from you! It just came to my house yesterday! Apparently the “mailman” (who is actually a woman – the people give strange names, don’t they?) accidentally took it to the wrong house. So another person brought it over for me! I must admit that I bark-bark-barked at this person when she came to the door. I did not know she had a card for me. I especially did not know that she had a card with such a pawesome photo of two very good-looking Dogs on the front! Thank-you so much for the card! I am glad that you won the card contest – you two deserve it! They look so cute with the little scarf on each of them!